My wanderings took me to a second-hand bookshop – the only one in my town (sad thought, isn’t it?) It’s not a very big bookshop. They don’t even arrange their fiction by genre (except for romance which has a whole wall for itself – guess that tells you all you need to know about my town). They do, however, have two sections for English fiction. Not for older books and newer books. Not for better versus poorer condition. It seems that they initially arranged their books from A to Z and, when they got a bunch of new stock, created a second section rather than spread out the existing books on the shelf to make space for the new ones. If you’re staring at the screen thinking, “What am I supposed to be looking at?” let me enlighten you. 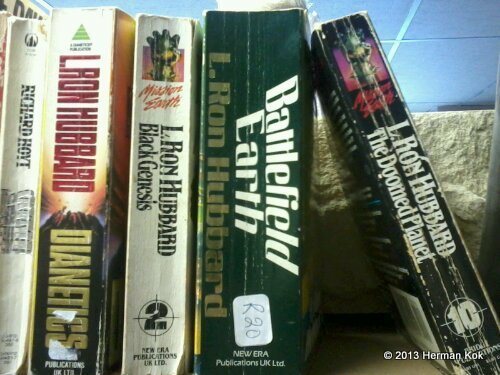 Yes, L. Ron Hubbard was a well-known Science Fiction writer, so his books belong in the fiction shelf. However, Dianetics is not Science Fiction. Dianetics is a self-help book that Hubbard later expanded to form his “religion” called Scientology. (On second thought, maybe the fiction shelf is exactly where it belongs 😀 ) And on the second fiction shelf, also filed under H, another copy of Dianetics. I also spotted an Afrikaans translation of Arthur C. Clarke’s 2010 in a shelf full of English non-fiction. I have only one explanation for this…shall we call it negligence? The people who run this bookshop don’t love books. They don’t know their merchandise. They merely sell it. It’s just a business. I’ve noticed the same thing at the video store: dramas shelved under comedies, decidedly adult comedies shelved under kiddies, etc. There used to be a bookshop in town that had a manager who loved his books. I’m pretty sure the manager read every book there – if I walked in the door he would approach with a book in his hand that he thought I would like. That’s another thing. He did not only knew his books, he knew his customers and what they liked. For him it wasn’t just business. He loved it. This experience reminded me that you must love what you do if you truly want to do it properly. I’ve been wondering more and more often whether I made the right decision quitting my job at the school. I was quite good at it, if truth be told. But I didn’t love it. I loved the kids, but not the work. And it was starting to show, at least from my perspective. To continue with something I didn’t love would only frustrate me and eventually it would negatively influence the children with whom I was working. While it is possible to do something well even if you don’t love it, loving what you do will always make it better. The ideal is, of course, to do what you love, but more on that later. *Sigh* That’s indeed the dream. When you don’t love what you do, it shows—especially if you work at a company where you have to meet clients and have frequent interaction with your boss. (That’s what happened to me.) I think we all sort of gravitate towards what we love, and we’ll get there eventually. But most people don’t realize that finding your passion early on really changes everything: the way we look at life, the way we “work”, and our interaction with each other. This is why I love Ken Robinson’s “The Element”, which I have written about on my blog. There’s a big BUT with this approach, however, and it’s called “reality check.” Some—if not most—people just don’t have a choice. “If you don’t like your job, quit” may be impossible to do for them. I’m going to write about this one of these days.. Your description of the second-hand book store makes me a bit sad and nostalgic. I blame You Got Mail. I, too, prefer a more personal communication and recommendation from the storekeeper, ideally people who really love books and know about them. It’s not very efficient, granted, what with Goodreads and Amazon and blogs where you can practically find reviews everywhere— but still. Anyway, I don’t know if you’ve checked out Book Depository, AwesomeBooks, or Abe Books yet? They’re very cheap, usually much cheaper than my local book stores—where there’s barely any interaction anyway, so I don’t benefit either economically or socially. Thanks for your comment, Daniel. I wrote a bit more about this today (just posted). Yes, I was very fortunate to be in a position where I could quit and start something new. But starting something new is sometimes (usually?) much harder than simply sticking it out where you are. And you can learn to love even something you don’t love at first if you really want or need to. On the other hand, sometimes you must just take the risk, no matter how idiotic or irresponsible it might seem to anyone else. I’ll check out those sites, thanks. I see at least one offers free worldwide delivery. Usually shipping to SA costs more than the books themselves. I feel you. When I was writing my thesis, weeks used to go by without me talking to anyone except my husband over the dinner table. I think finding a friend who’s in a similar situation as you will help, be it a ‘real’ one or a ‘virtual’ friend online. I used to have phases of hating what I thought I loved doing too; namely reading and writing, when I couldn’t verbalise what I wanted to say in a coherent manner. Then I went into a downwards spiral by questioning why way too often. However, coming back to it after a little break helped me a lot. Thanks for your comment. It’s good to know it is normal to feel this way 😉 Yes, virtual friends here and on facebook are what’s keeping me sane at present. Also a great excuse for procrastination. You have to understand that I spent the past five years as a teacher. For most of the day every day I was interacting with others. Now an entire week can go by where I talk only to my wife. It’s a bit of an adjustment.